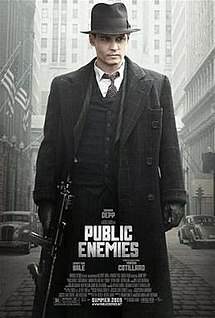 The other evening Rob and I went to see Johnny Depp’s newest film, “Public Enemies.” I had seen the trailers and read some reviews on Rotten Tomatoes, so I had an idea that it should be a pretty good movie. The movie stars Johnny Depp as John Dillinger, Christian Bale as FBI agent Melvin Purvis and Marion Cotillard as Dillinger’s girl (Billie Frechette). The movie is a very interesting mix of a mobster action movie, a suspense movie and a love story. Unfortunately, I just didn’t get it.